Christian Wurst will join Panalpina as the regional CEO for Europe by February 2019. 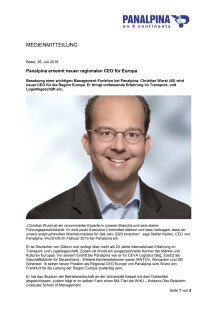 “Christian Wurst is a distinguished industry expert and strong leader. He will strengthen our Executive Committee and help us reach our ambitious growth targets for 2020,” says Panalpina CEO Stefan Karlen. Wurst will join Panalpina by February 2019. German-born Wurst has more than 20 years of international experience in the freight forwarding and logistics industry and a broad knowledge of European markets and cultures. 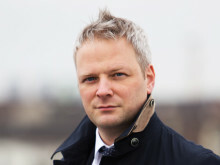 He joins Panalpina from CEVA Logistics where he most recently held the position of Managing Director Germany. 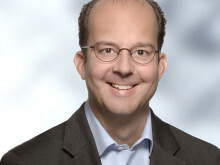 He has also worked for RWTÜV, Wincanton, and DB Schenker. In his new position as Panalpina’s regional CEO Europe, Wurst will be based in Frankfurt and responsible for the Europe region. 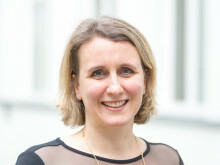 Wurst holds a PhD in Business Administration from the University of Kassel and an MA in Business Administration from WHU – Koblenz Otto Beisheim Graduate School of Management.